This bedspread/quilt is exactly what I wanted. It's velvety-soft on one side without being too thick or fuzzy, and the cotton reverse side is also soft. The ivory color is a pale cream/off-white, which goes perfectly with my other bedding colors. It is definitely longer than an average quilt, and it hangs almost to the floor on my king-size bed with the deeper mattress. I originally ordered the oatmeal, which was a light tan/brown (versus the dark cream color on the ad), but I had no trouble with the return process. I really liked the oatmeal shade, but it didn't match my other bedding. I'm probably going to get the burgundy bedspread/quilt also-it's definitely a quality product! 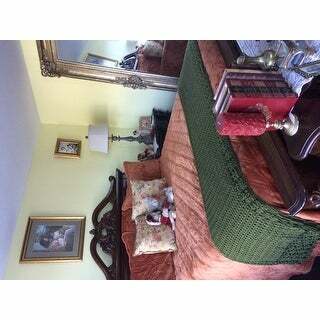 Serenta Super Soft Microplush Quilted 4 Piece Set is the softest bedspread set yet. Made of ultra-fine microfibers, this fabric is single-sided with velvet-like fibers that retain warmth better than fleece. Give your master suite an inviting look with this four-piece quilt set, complete with one bedspread, two pillow shams, and one throw pillow. Their solid-hued design sets an understated foundation in your bedroom, while scalloped accenting and embroidered details offer a boost of style. Made from 100% polyester microfiber, these pieces resist wrinkling and fading to keep your space looking crisp. Best of all, they're safe to go in the washing machine on a cold cycle for a quick refresh. COMFORT MADE WITH STYLE! 11 Design Variations: Taupe, Chocolate, Pink Burgundy, Antique White, Blue Sapphire, Brick, Oatmeal, Silver Blue, Steel Grey, and Sage. JUST THE RIGHT SIZE! Available in 2 sizes. - Queen Size Contains: 1pc Bedspread 110" x 120", 2pc Pillow Shams 20" x 26" +2", 1pc Decorative Pillow 16" x 16; - King Size Contains: 1pc Bedspread 120" x 120", 2pc Pillow Shams 20" x 36" +2", 1pc Decorative Pillow 16" x 16. EASY AT HOME CARE! Machine wash, separately, using cold water. Tumble dry on lowest heat setting to avoid heat damage. Your bedspread can lose its softness and texture if washed in hot water or dried using high temperatures. When properly cared for, you can enjoy your bedspread for a lifetime and expect the color to last due to in-house pre-treatment. Serenta BRAND BRILLIANCE! 100% Polyester fabric is non-shedding, snuggly, and high-quality crafted. Dimensions 120.0 In. X 120.0 In. X 1.0 In. This bedspread is super soft. This is the second one that we purchased. I had been nervous about getting the off-white but am now so happy with it. The white is cheerful and I can add seasonal pillows and other decorations in the room without clashing with the bedspread. I would definitely purchase this bedspread again! Love the bedspread and pillows. Covers the bed beautifully. Very soft. Having a difficult time removing the wrinkles caused by the packaging. Had a few loose threads. This is such a lovely quilt. If you are wanting to bring in the AUTUMN season to your bedroom, this quilt will surely please you. I am not sure if my computer displayed the color incorrectly or what, but the item color was not what I was expecting. Thank you for the speedy return processing! Not quite what I was expecting. Mostly my fault, I should have ordered the lighter color. Also, it was really big on a queen bed, hung on the floor and I really don't like that look. This bed spread is described as being "Sapphire Blue". It is GREEN. Also, it lacks a few inches being floor length with my 18" mattress. Loving this bedspread set so far. Bought it in taupe to go with the blues in my room and goes quite nicely with my colors. Bedspread was a little hard to figure out how to put on the bed, all sides have a scalloped edge. Has a slight feel between microfiber and velvet but quite nice. Would recommend with a extra bed sham for a full floor look. Love this. Exactly how it is pictured. The size is generous and will go to the floor. I purchased the chocolate cover and I am very pleased with it. Very soft. I would recommend this. This bed set is absolutely lovely! I love the generous size, the material is of excellent quality, the design is tasteful and will go with any decor and the color is perfect! You cannot go wrong on this one! This bedspread is very nice. It is soft and just the right weight. I love how it fits so well on our king size bed. This is wonderful soft luxurious and more formal than casual, keep that in mind if you are interested. I purchased it in royal blue. AMAZINGLY SOFT!!! We love this bedspread!! It is so cozy!! It makes it so hard to get out of bed!!! The sides are long enough to hide the adjustable part of our bed. Love it got the choc brown. So pretty and actually long enough on each side so don't need a bed skirt. Have had a hard time finding one long enough in the past. Very pleased with purchase would highly recommend. "Will you be getting the blue sapphire in a queen in the near future?" "Do you anticipate getting this in the chocolate color in king size?" " what color is scuba blue? light blue or abrighter blue?" "what is scuba blue? light blue or brighter? " Serenta supersoft miroplush quilted 4 piece bedspread set has a color taupe ...what is the color?? brown or gray brown?? ?